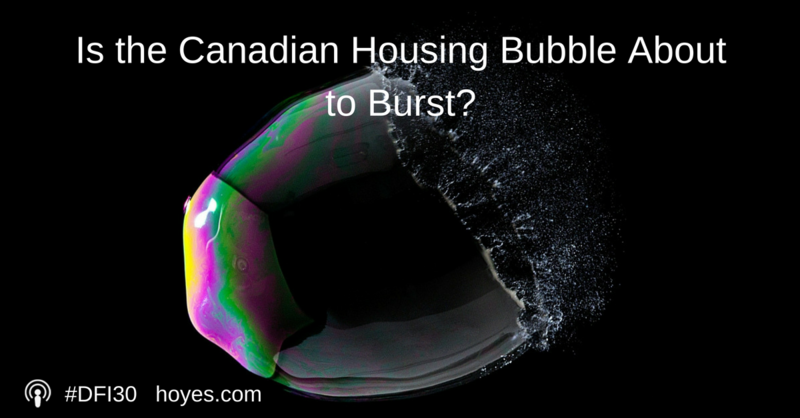 Home » Blog » Is the Canadian Housing Bubble about to Burst? Have house prices in Canada gotten out of hand? Is Canadian real estate due for a crash? On today’s show, I speak with Hilliard MacBeth, a portfolio manager and author of When the Bubble Bursts: Surviving the Canadian Real Estate Crash, who thinks the Canadian housing bubble is about to burst. He mentions that there is a prevailing myth that only Vancouver and Toronto are in a real estate bubble, when in fact the bubble exists across Canada. While incomes have only risen by 15% in the last 15 years and inflation has been under 2% for a long time, house prices have tripled. Considering that houses are paid for with income, the ratio of house-price-to-income has become so stretched that the bubble is no longer sustainable. If you go to the bank and the bank says you’re approved for a $700,000 mortgage and you’re 30 years old and you’ve just gotten married and your combined income in the household is $150,000, that’s a very unusual situation. And in fact in my research, it’s never happened before in the history of lending and housing anywhere. But that’s where we’re at today in Canada. An added problem is that a high ratio mortgage is a bankruptcy risk. Once people start filing insolvency because they can’t keep up with their mortgage payments, this leads to tighter credit, and one more factor that can burst a housing bubble. And contrary to popular believe, it is possible to walk away from a mortgage in Canada. Hilliard acknowledges that when the bubble bursts, it will end painfully for a lot of Canadians. Especially because of the debt involved with mortgages. The pain will come from foreclosures, personal bankruptcies, and the laws surrounding debt. Is it as simple as saying well you got the CHMC, which is the government and tax payers inflating this bubble, allowing people to borrow more and that’s why house prices are as high as they are? He believes it is that simple – the numbers show that the total household debt level has grown rapidly in this bubble, making Canada’s total household debt level one of the highest in the world. He explains how aggressive banking and lending practices are partially to blame. Where the lenders eventually realize that the borrowers can’t pay the debt back and they completely change their attitude towards their willingness to provide new credit. And that’s when the whole thing comes crumbling down. Hilliard feels that the Canadian Minsky moment will be precipitated by a combination of lenders tightening up their lending rules and borrowers defaulting on their mortgages. Contributing to the bubble is that many people in Canada do not believe that the bubble will burst. They think that Canada is immune because of our still relatively low interest rates and immigration. But Hilliard couldn’t find any research to suggest why Canada would be different from other countries that have experienced a crash. The worst part about it is Canada’s bubble is actually quite a bit more stretched than the U.S ever was at the peak of the U.S bubble. So what will cause the crash? A recession. Once people start losing their jobs and defaulting on their mortgages, banks will tighten their lending rules. Lending, all over the world, not just in Canada, but all over the world, is what they call a pro-cyclical activity, which means that when things are great and the bubble is inflating, and everybody’s flying high, the lenders are willing to lend more money on easier terms. 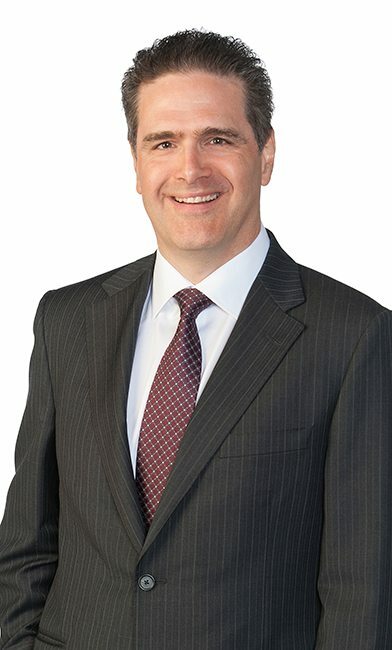 Hilliard was concerned to learn from young couples in Alberta, that banks would offer to lend much more than their intended budget, even offering to lend up to a million dollars. As a result, the young couple will find the houses in their budget are not as nice, and become inclined to take the banks up on their offer, purchasing a far more expensive home. But once people start defaulting, banks will change their attitude towards lending – and people will not be able to borrow as much. And when they cannot borrow as much, house prices will come down. If you have to sell your house because you’re in some kind of personal financial difficulty and all of the buyers are being restricted by the lender on much tougher terms, then house prices have to come down. So, that’s all it would take. Is the Canadian Housing Bubble Already Bursting in Some Markets? Hilliard notes that it’s already happening in some parts of Canada. He watches the Teranet National Banking Index, which follows 11 major metropolitan areas in Canada. Seven regions have been in decline for several months with the exception of Vancouver, Victoria, Toronto, and Hamilton. Different regions of the country are already in different stages of the bubble bursting. What Should Those Looking to Buy a House Do? My advice is that if you’re looking for a place to live and you don’t mind going through a period of downward adjustments in house prices, which is inevitably going to come at some point, then buy what you can afford to live in. In addition, a general rule of thumb for affordability, that used to be in place before the bubble, is to purchase a house worth less than 3 times your family household income. This means not including the income of anyone who will be taking time off from work. It’s better off to just imagine you have a million dollars sitting in your bank account and you say I’m going to walk out today, I’m going to buy a million dollar house or condo in Toronto, or I’m going to rent one. And when you do that calculation on that basis, renting is much preferable from an investment point of view, unless prices continue to appreciate. And at some point, you know, that’s a pretty big gamble. As I write this in the summer of 2016 the real estate market in Toronto and Vancouver is “crazy”. A one bedroom condo in Toronto can easily sell for $500,000 (and more in Vancouver). If you buy that condo with the minimum of a 5% down payment, your $475,000 mortgage, if you can get a 5% rate (and you pay a higher rate due to the low down payment mortgage insurance requirement) your monthly mortgage payment is $2,763. Add in condo fees, utilities and repairs and maintenance and that condo will cost you $3,500 per month, and that’s before you pay for food or transportation! And it’s only a 600 square foot condo! If you are single, and in the 30% tax bracket, you need to earn $60,000 per year before tax just to pay your shelter costs, not including food, transportation, or anything else. It’s those numbers that convince Hilliard Macbeth that we are in a housing bubble, and it’s hard to argue with him. However, you could have made the same argument last year, and the year before, and house prices keep going up. That $500,000 condo this year was only $400,000 three years ago, so buying then, even with a huge mortgage, was a good investment, if you could keep up with the payments. And that’s the problem: the monthly payments. If you get behind on your mortgage payments, you’ve got a problem. House prices won’t keep going up forever, so at some point the bubble will burst; I just can’t tell you when it will happen. Learn more listening to the show or by reading the transcript below. Doug Hoyes: Is real estate in Canada in a bubble? Has it gotten so high that it’s due for a crash? My guest today thinks so and we’ve got lots to talk about. So, let’s get started. Who are you, what do you do and what’s the name of your recent book? Hilliard MacBeth: My name is Hilliard MacBeth and I’m a portfolio manager. I’ve had clients in the investment industry for over 37 years. I wrote a book, which came out in March of 2015 called “When the Bubble Bursts: Surviving the Canadian Real Estate Crash”. And as you can imagine it’s received lots of attention. Previously, I wrote a book in 1999 called “Investment Traps and How to Avoid Them” and the main topic there was the buy high trap of the dot.com bubble in 1999, which crashed eventually in 2000. So, I’ve got lots of experience with bubbles and crashing. I’m also the head of a group called The MacBeth group. And that’s the website where people can reach me. It’s www.themacbethgroup.com. Doug Hoyes: Excellent. Well, I appreciate you being here and we’ll put links in the show notes to everything we talk about, including that website. So, it’s MacBeth, just like the Shakespearian character, is that how you spell it? Hilliard MacBeth: Yeah, there’s different spellings, M-A-C-B-E-T-H so themacbethgroup.com. Doug Hoyes: Excellent. So, okay and in your book, which I have read, you do go through at least briefly the history of some of the bubbles and, of course students of economics will all be very familiar with, like the tulip bubble, which I guess was the first big one that anyone would be aware of from 400 years ago. So, let’s talk about the Canadian real estate bubble then. So, why do you think we are in a bubble? Let’s start with that question. Doug Hoyes: So, it’s not just prices going up. Because I guess I don’t know, I mean the price of bread is probably higher than it was 15 years ago. That doesn’t mean a loaf of bread is in a bubble. Are loaves of bread in bubbles too? Hilliard MacBeth: Well, I think what happens is bread is that if the price of bread – it would be hard for the price of bread to go up faster than the rate of inflation than the wages that people earn because people can substitute. Whereas with housing, what happens of course if people get it in their head that they have to absolutely buy a house, which is something we could probably spend the whole show on. But once people get that idea in their head, then they stretch – as long as the lenders are willing to accommodate them, they’ll stretch to any level. So, that’s something that can happen but it always ends painfully. Every bubble that has ever occurred in the history of bubbles and the history of the financial world on this planet has burst eventually one way or another. Now they can go higher like Toronto has in the last year for awhile and in fact at the very end of the bubble you sometimes get price increases that are more rapid. But every bubble bursts and every bubble bursts in a way that causes a lot of pain. And this particular bubble, because there’s so much debt involved, debt is of course the dangerous part of this whole thing, is going to be extremely painful. If house prices were bought, if houses were bought without debt being involved it would be very difficult, first of all, to have a bubble because can you imagine if everyone had to save up all the money from their wages before they bought a house with no debt? Of course house prices would be less than $100,000 probably. But there wouldn’t be any problem, house prices could go down, it doesn’t matter. It’s because of the debt that’s involved and the rules that are around that debt and how things like foreclosure and personal bankruptcy and all that sort of thing come into it. That’s where the pain is felt. Doug Hoyes: Yeah and obviously that’s why I wanted to have you on this show. The show is called Debt Free in 30. And I think you’re exactly right, it’s not the house prices themselves that’s the issue, it’s the debt component. It’s not the asset side of the balance sheet, it’s the liability side. So, the prices of bread is not affected by debt. Very few people I know borrow money to buy bread; it’s something we pay cash for. Whereas a house, you just said it very few people pay cash for a house. And it hasn’t always been that way. I mean I don’t know, 100 years ago, 150 years ago, fewer people owned houses, but the people who did either – well, they paid cash. I guess if they were settlers out west and they were perhaps given the land by the government and they, you know, put up a structure on it. There was no debt involved. It really is the debt piece that is what’s driving house prices higher. Is it as simple as that? Is it as simple as saying well you got the CHMC, which is the government and tax payers inflating this bubble, allowing people to borrow more and that’s why house prices are as high as they are. Hilliard MacBeth: I think it is that simple because the numbers show that the debt has – the total household debt level, which by the way is one of the highest in the world, it’s in the top of five of all 30 developed countries in the world. And it’s growing very rapidly in this bubble, it’s just about tripled in 15 years, which again has never happened before probably in the history of Canada or probably in the history of any developed country. It’s definitely the main factor. There used to be different rules. As you know, being an expert in the field, you probably are very aware of this, but some of your listeners may not be. There used to be a rule that said they didn’t count both incomes for example. Which was, maybe it was a sexist rule ’cause they assumed the woman was going to get pregnant and quit her job. But when you think about it, counting both incomes, it’s very aggressive because the amount of debt that people are taking on, as much as a million dollars in debt to buy a house, implies that two people will be working for 30 years full-time and using most of their after tax income to pay down their debt if they plan to pay off that house. So, the attitude of lenders is extremely important. I talk about Minsky, who is an economist in the U.S who studied this. And unfortunately economics they don’t spend a lot of time on debt and it’s really unfortunate. But he did. And there’s a crisis called a Minsky moment where the lenders eventually realize that the borrowers can’t pay the debt back and they completely change their attitude towards their willingness to provide new credit. And that’s when the whole thing comes crumbling down. And it happened in the U.S in 08/09 and unfortunately it’s going to happen in Canada as well. And I don’t quite know how the sequence will go, whether it will be the lenders that start it or the borrowers defaulting. It’ll probably be a combination of all of the above. Doug Hoyes: Well, so what you’re saying is we’re in a bubble and the bubble is eventually going to burst. So, let me play devil’s advocate here and say no, you’re totally wrong. Number one we’ve got immigration, more people coming into the country and as a result that’s going to keep house prices high. Number two, we’ve got low interest rates and there is no hope that the government will ever raise interest rates in our lifetime because they can’t, that would crash the government. I mean they’ve got massive amounts of debt so they have to keep interest rates low. So, so long as interest rates remain low, so long as immigration keeps happening, house prices, yeah maybe they go down a couple of points, up a couple of points, but we’re not going to see any kind of crash, any kind of bubble. What say you on that point? Hilliard MacBeth: Well, the basis of that and, you know, that’s certainly a widespread belief, I’ve run into that many times. You know, it’s interesting to believe that Canada is so special that what’s happening pretty well every other country that’s had a housing bubble, would not for some reason happen. We’d be the one country, where you didn’t have a bursting of the bubble. The U.S certainly had it just a few years ago. And one of the things that prompted me to write the book was I was shocked, literally shocked, at how little attention the U.S situation got in Canada here. People paused briefly in 2009 in their quest to take on more debt in Canada. And then they resumed full tilt. In fact the rate of increase of debt never reached the peak, which most rapid increase in debt was in 2006, just before the U.S bubble burst. But the pace of increase certainly picked up after crisis, after pausing briefly. And people just carried on and partied on like there was no tomorrow. And I pointed out to people I knew and saying well look what’s happening in the U.S, there’s a global financial crisis triggered by mortgage debt in the U.S which couldn’t be repaid and the lenders finally got spooked and withdrew their willingness to lend and the universal thing was, Canada’s different. But I couldn’t find in several years of research and several years of talking to people, any reason why Canada would be different. The worst part about it is Canada’s bubble is actually quite a bit more stretched than the U.S ever was at the peak of the U.S bubble. So, what would cause it? First of all, interest rates do not have to rise, there’s no rule that says interest rates have to rise. If you look at Japan, Japan peaked in 1989, prices are lower today in Japan than they were in 1989, two or three decades ago. And their interest rates were much, much lower than they are today in Canada. They’ve been below 1% for more than 20 years. So, interest rates are not necessary. All it would need would be for a recession to hit Canada. And there always has been recessions and there always will be recessions. About every five to 10 years we have a recession. The one in 08/09 was very unusual because it was so mild, which means you have to go back quite a long ways to the last recession. Would it be in the early to mid 1990’s in Canada. But a recession, what happens in a recession? Well, people lose their jobs in a recession, that’s what happens. And so, then what happens is when people lose their jobs, they can’t pay their mortgage payments. And when people can’t pay their mortgage payments, what happens is the bank finds out. And the bank is not in the business of forecasting when people are going to stop making their mortgage payments. The lenders basically wait until after they start noticing people failing to make their mortgage payments and then they get concerned. And that’s when they start tightening up the rules. Unfortunately lending, all over the world, not just in Canada, but all over the world, is what they call a pro-cyclical activity, which means that when things are great and the bubble is inflating, and everybody’s flying high, the lenders are willing to lend more money on easier terms. And the lenders will say to a young couple when they come in for approval of a mortgage, the couple’s looking at a $400,000 house. The lender will say, well you know with your incomes we could lend you seven, or $800,000. This happened, I know from talking to many, many young couples in Alberta, where I’m based, the bank would throw out that comment quite often. They would say we can get you up to a million dollars if you wanted. And of course the young couple says well, no, no, no we only want to spend $400,000, we don’t want to get that deep into debt. And then of course you know what happens, when they go looking for a house, the houses at $400,000 don’t look very nice. So, one of the people in the couple turns to the other and says “you know the banker said we could get seven, eight even $900,000. We wouldn’t want to borrow that much but maybe we should look at a more expensive house.” So, that’s what happens during the bubble formation. But after people start defaulting because of a recession, let’s say just for example, then the attitude of the lenders changes 180 degrees. And now you’ve got some very restricted, difficult terms and conditions as there is in the United States now. And people can’t borrow as much. And if people can’t borrow then house prices have to come down. If you have to sell your house because you’re in some kind of personal financial difficulty and all of the buyers are being restricted by the lender on much tougher terms, then house prices have to come down. So, that’s all it would take. And for pro-cyclical of course means people lend freely at the peak of the market and they lend very carefully and very cautiously at the bottom of the market. And it’s really unfortunate. But it isn’t Canada’s fault. It isn’t really anybody’s fault, it’s just the way the world works. Doug Hoyes: Okay, so you believe that real estate is overvalued in Canada, you believe that at some point the bubble is going to burst and real estate prices are going to come down. And you sketched out a few ways that that potentially could happen, but really the more important question is okay when? Because if I’m looking to buy a condo in Toronto for example, I could buy it today and maybe house prices will go up for two or three more years. And when the inevitable correction happens well it brings it back to where it is today, I haven’t lost anything or I guess it could crash tomorrow. So, do you have any thoughts or when that could potentially happen? Hilliard MacBeth: Well, I know that it’s already happening in parts of Canada. Some of the latest numbers that have come out show that it’s really only four out of 11 – the index that I prefer is called the Teranet National Banking Index because it’s – the way that they calculate it is more rigorous than the Canadian Real Estate Association Index, which is the one that gets quoted more often. There’s 11 major metropolitan areas in Canada as measured by the Teranet National Banking Index and seven of them have been in decline for several months now, four of them are still going up. So, the four that are still going up are Vancouver and Victoria, which you could argue are basically one entity, and Toronto and Hamilton, which also are very closely linked obviously. In Alberta, for example there’s tremendous angst over the drop in oil prices. And there are very widespread job losses, which haven’t really totally fed through the system in terms of coming out in the numbers. And obviously people that borrowed seven, $800,000, if they are involved in that and almost everyone is, there’s going to be a difficulty with paying the mortgage. So, I think that’s probably where we’re at. In different regions of the country, we’re in different stages of the bubble bursting, but I think it’s already started. And it’s a 10 year process. I get that question a lot: when? So, I’ve thought a lot about what is really behind that question. And it’s interesting because if you think of your house as a place to live, which in my opinion is the correct way to look at it, the reason that you’d be thinking about when the bubble bursts, is you’d be waiting to buy a house maybe ’cause you don’t want to pay too much, but you’re probably going to stay there for a long time and you’re probably going to pay off the mortgage. So, it doesn’t affect you all that much as long as you don’t buy a house you can’t afford. But if you’re speculating in the housing market, then the question of when is really important. You know, is it – is there time to buy, experience a few more years of gains and then sell again and make a profit? But that’s using house as a speculation and to me that’s just plain crazy, especially at this point in the cycle. I mean we’re at the end, I’m saying we’re at the end of a 15 year run, well what if I’m wrong and it goes 17 years. It’s unlikely that people are going to be able to buy and sell that adroitly that they can get in and get out, especially with housing being a relatively ill liquid investment or asset, I guess I shouldn’t call it an investment. You know, it’s very dangerous to think people can get in and get out. I mean the whole idea of buying a house at this point in the cycle is based on the bigger fool theory of investing. So, the bigger fool theory of investing goes like this, I’m a fool to pay this price for this condo or this price because prices I know have tripled in the past 15 years. And that hasn’t happened in the history of the world more than just a few times. And it’s always ended in tears and pain for everybody that’s involved. But I’m a fool to do that but there’s an even bigger fool that’s going to come along a year from now and pay a higher price and therefore I’ll be able to get out with a profit. It’s crazy thinking, basically is what it is. And I mean for instance you mentioned condos in Toronto. I mean anybody that’s buying a condo in Toronto, and the same in Edmonton and Calgary for that matter or Vancouver, can see how many condos are under construction. So, when somebody’s buying a condo thinking of price appreciation, they’re assuming that they’re going to be able to flip it sometime in a year or two to a new buyer, but that new buyer is going have a choice of all these new buildings that are under construction today. Your condo, which is now two years old, and the brand new condo and the developers of that new condo are obviously going to be working really hard to sell with a lot of advertising and a lot of sales agents, their brand new condo and you’re in completion with that. So, that really doesn’t make any sense but that’s what people are caught up in right now and that’s what happens during a speculative bubble. People get caught up in the frenzy and their ability to think about these things rationally disappears. 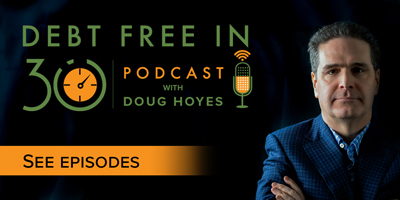 Doug Hoyes: Time for a quick break, we’ll be right back on Debt Free in 30. It’s time for the Let’s Get Started segment here on Debt Free in 30 where we focus on practical advice. My guest today is Hilliard MacBeth who believes we are in a real estate bubble and house prices are headed lower. So, what’s your advice for people who are considering buying a home? If house prices are headed lower they shouldn’t buy, but the risk of not buying now is that house prices continue to rise and they’re priced out of the market. So, what’s your advice to Canadians about real estate today? Hilliard MacBeth: My advice is that if you’re looking for a place to live and you don’t mind going through a period of downward adjustments in house prices, which is inevitably going to come at some point, then buy what you can afford to live in. And the rule of thumb for affordability that was in place for decades, if not centuries, prior to this bubble was three times family household income. And that assumes the family household income is conservatively calculated. In other words if there’s two incomes but you know that one income is going to cease at some point ’cause one person wants to take some time off to start a family or something, then don’t count that income. So, three times family income, the average family income in Canada is $72,000. The average family income in Alberta, which was the highest and these numbers are out of date now ’cause family income is dropping in Alberta, but the peak was about $100,000 in Calgary and Edmonton. So, that would imply in Calgary and Edmonton you could pay $300,000 for a house and the average everywhere else would be well under $300,000. So, given that, you look around at what you could afford and there isn’t anything obviously available, really very little available in most major cities, so then that means don’t buy, rent. And renting is, for various reasons, renting is vastly under appreciated as a strategy. And first of all the only way that renting is a losing strategy in housing is if houses continue to appreciate, if they continue to go up. Then obviously you are missing out on the gains that you would have made and it becomes more difficult to buy later on. But if you assume at some point house prices have to correct, then renting will always be the better strategy. For example you can rent a million dollar condo, let’s say you can rent it for, let’s pick a number, I don’t know the exact number but I know it’s let’s say $3,000 a month, just to pick a number. Well, my guideline for the cost of owing that condo, with condo fees and everything, is about 6%. So, that’s $60,000 a year, which is $5,000 a month. So, you’re saving $2,000 a month by renting versus owning if you can rent that condo at $3,000. Now if that condo is rising in value at 5% a year. A million dollar condo going up 5% a year, that’s $50,000 a year, that’s roughly $4,000 a month. So, obviously the renting is a disaster ’cause you’re missing out on $4,000 a month of price gains. But let’s assume that just for fun that I’m right and at some point the prices start to go down. And let’s be conservative and assume they’re only going to drop by 5% a year so now that million dollar condo is going to go down by 5%. It’s going to go down from a million to $950,000. Well, you just saved $4,000 ’cause you’re renting and not owning. So, you’re paying $3,000 for the rent but you just saved $4,000 a month on loss of capital that you put up. Because the loss doesn’t go to the lender, the loss goes to the buyer of the condo as you know. Now you’re basically living rent free if you’re renting at $3,000, you’re avoiding a loss of $4,000 a month plus in renting you’ve also got that million dollars that you can invest. And there’s some very safe, decent preferred shares for example in the Canadian market that you can get 4 or 5% dividend yield without any trouble. So, you’re also collecting 40 to $50,000 a year in income on that million dollars. Now you’ll notice in that example I deliberately avoided mentioning mortgages and all that because the easier way to calculate whether renting is better than owning is to assume you’ve got the purchase in a cash fund and not worry about mortgages because mortgages really, you know, it’s – there’s all different mortgage rates, they change, you’re making a 25 year commitment. Yes, the mortgage rate today is really low but it’s unlikely that it will stay that low for the whole 25 years. So, it’s better off to just imagine you have a million dollars sitting in your bank account and you say I’m going to walk out today, I’m going to buy a million dollar house or condo in Toronto, or I’m going to rent one. And when you do that calculation on that basis, renting is much preferable from an investment point of view, unless prices continue to appreciate. And at some point, you know, that’s a pretty big gamble. Doug Hoyes: So, there you have it. House prices have increased for many years and nothing goes up forever. So, now may not be the time to be taking on a lot of debt to buy a house. That’s the Let’s Get Started segment. I’ll be back to wrap it up right here on Debt Free in 30. Doug Hoyes: Welcome back, it’s time for the 30 second recap of what we discussed today. My guest today was Hilliard MacBeth, who says that Canadian real estate prices are at all time highs and are in a bubble and that bubble will eventually burst. That’s the 30 second recap of what we discussed today. As Mr. MacBeth said, the real estate bubble is caused by debt, if we had to pay cash for our homes, there would be no real estate bubble. Just because the banks says you qualify for a huge mortgage does not mean you have to borrow the maximum amount possible. For many people today, renting is a perfectly sensible option.